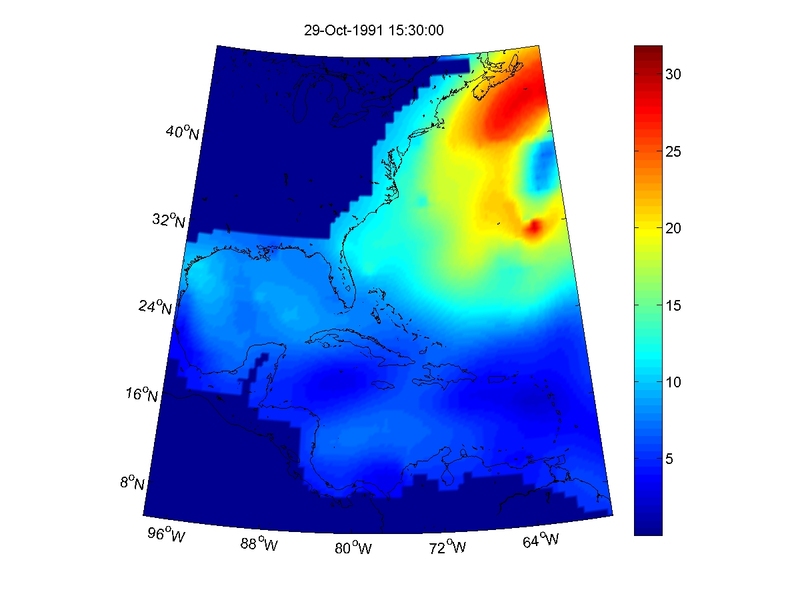 Map of winds during the Perfect Storm of late October, 1991. Color shading shows wind speed (in meters per second, roughly double it to get knots or mph). The storm caused what has been estimated as “500-year” flood elevations storm surge for Boston. A storm with similarities to the Perfect Storm of 1991 is expected to come northward by early next week and may make landfall in the Northeastern U.S. or Canadian Maritimes. Some have been mentioning that the storm would arrive near the full moon and thus spring tide, so I wanted to make a quick post explaining that predicted the tide ranges for the New York City region aren’t going be too bad during this period. Total water elevation at the coast, called the “storm tide”, is driven up by winds and low atmospheric pressure (components of “storm surge”), as well as the astronomical tides. Tides are predictable, as they are driven by the regular periodic orbits of the earth around the Sun and the Moon around the Earth, as well as Earth’s rotation. The tides predicted to be present early next week are slightly larger than average, due to it being a “spring tide” — a twice-monthly occurrence when the sun and moon’s gravitational forces are working constructively to create larger tides. However, this spring tide will actually be a weaker one than many, so the tide’s contribution to total water level isn’t going to be as bad as one might think — the tide range for spring tides varies from month-to-month for multiple astronomical reasons. The tide range will be only a little bit above average, actually — a range of 5.4 feet at Battery Park on Monday Oct 29, in contrast to the last spring tide (Oct 17) that had a predicted range of 6.5 feet. Average tide range for Battery Park is about 4.9 ft.
Heights relative to mean-lower-low-water (MLLW; average daily low tide level) — Predicted (astronomical) tides, observed total water levels (WL), and the anomaly (Obs-pred) at The Battery for October, 2012. The anomaly is mainly storm surge but can also include rainfall, freshwater from river inputs, and other minor influences. There is still a great deal of uncertainty on where the storm will hit, and how big a storm surge will be driven up by its strong winds. If the storm ends up approaching our region, people can visit http://stevens.edu/SSWS for water elevation predictions, and this blog for commentary and interpretation. This entry was posted in water, weather and tagged astronomical, forecast, hurricane, Hurricane Sandy, long island, new jersey, New York City, Perfect Storm, predicted, Sandy, storm surge, storm tide, tidal range, tide. Bookmark the permalink.